I land from my flight from Abu Dhabi and head to the lounge. 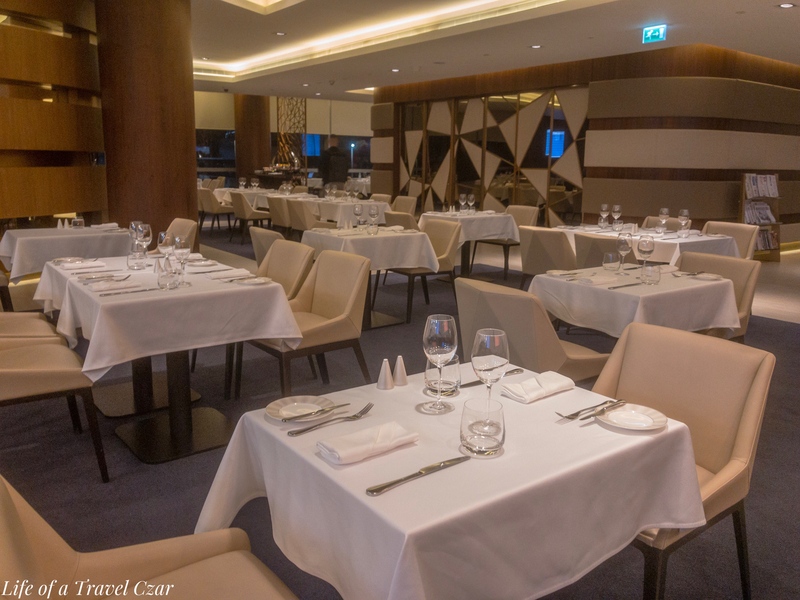 The First Class Lounge in Abu Dhabi is lovely, there’s beautiful bar areas, a cigar lounge, an open dining area, a spa and a set of shower suites. It is a pretty impressive lounge. Given I had a fair bit to eat on the flight, I decline the dining options and don’t even drink in the lounge. 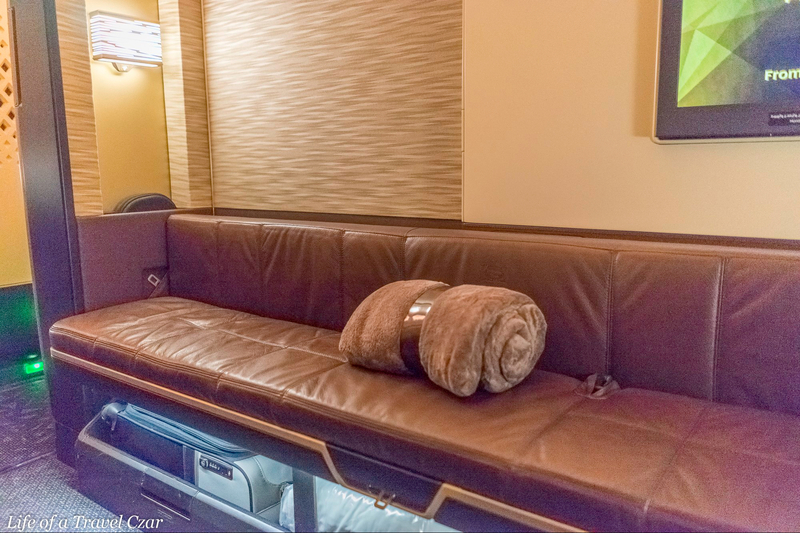 I opt for the spa treatment to rejuvenate myself and before long I have to leave the lounge to clear U.S. Customs and Border Protection (US CBP) through the pre-clearance facility. I have mixed views on the pre-clearance facility in Abu Dhabi. On the plus side you get to land in the USA as a domestic flight and hence all you have to do is pick up your luggage and head out of the airport. But on the other hand, you have leave the First Class lounge a good 1-2 hours before departure and go through another set of security checks and then clear US CBP. Mind you there is a premium lounge once you’ve gone through US CBP, but it is woeful compared to the First Class Lounge. If you’re a US Citizen or with one of the priority programmes (Nexus, TSA preclearance, etc.) you’d probably prefer if they didn’t have a pre-clearance facility and go through the process on US soil, but all passengers must do the pre-clearance. Eventually I board the flight to New York and I’m on the Airbus A380. 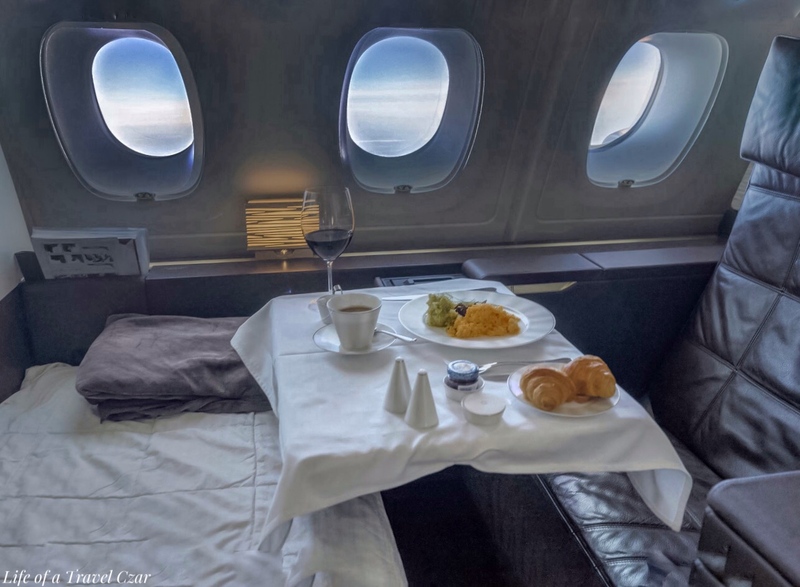 The apartment and configuration is the same as my prior trip; There are nine private apartments on the A380 which are fully enclosed; the product is almost unparalleled to anything I’ve flown before. There is 30-inch reclining lounge chair with full massage functions, a separate full-length ottoman which transforms into a fully flat bed. The chair and the ottoman are upholstered by Poltrona Frau, which provide the leather for Ferrari’s interiors. The only difference is the chair and ottoman have a dark chocolate coloured leather rather than the toffee colour on my previous flight. 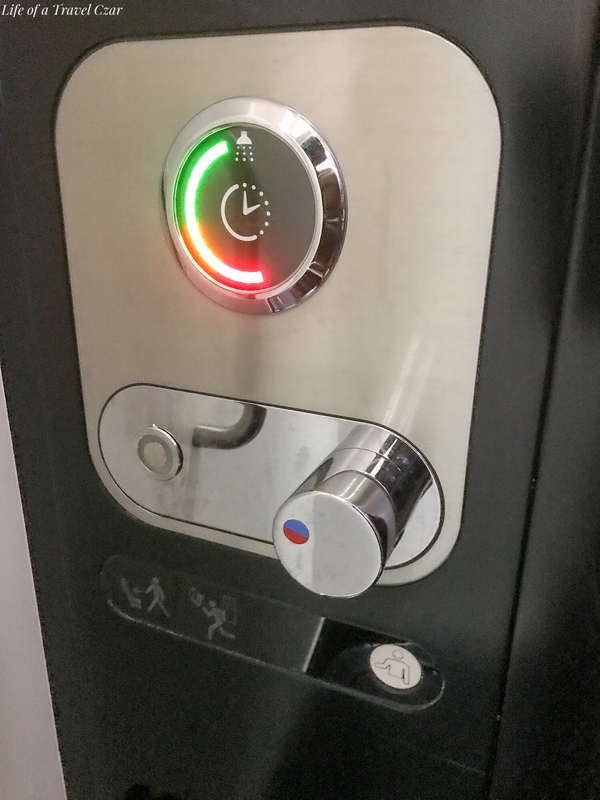 If you want to see the full range of seat and apartment controls you can check out the review here. I am provided with Etihad’s pyjamas which are designed by “A Friend Of Mine By Xpoze,” which is a local UAE fashion house. I slip them on soon after take-off. 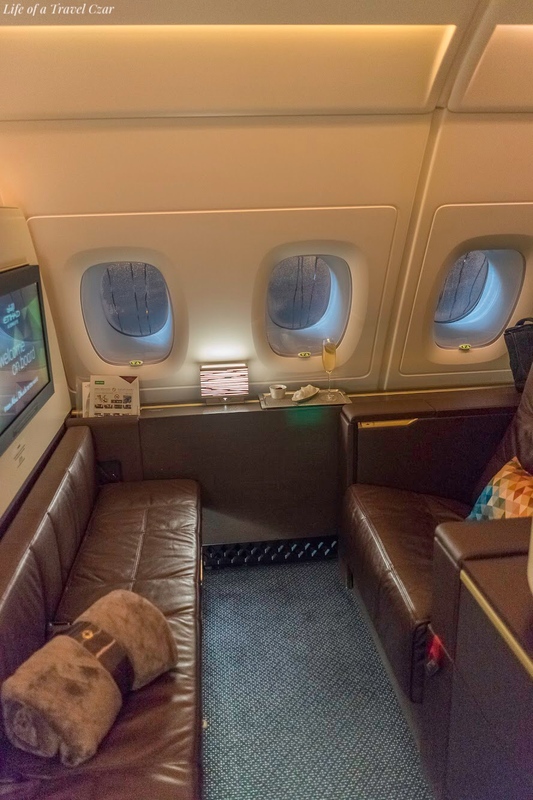 Etihad Airways also provided a luxury amenity bag from luxe fashion house Christian Lacroix and these were stocked with beautiful amenities from Hungarian skincare brand, Omorovicza. 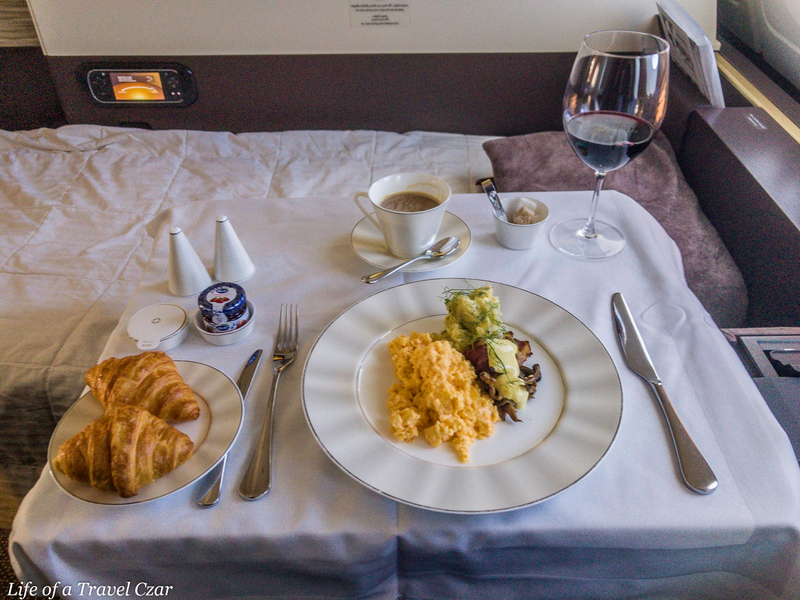 I reviewed these on the prior flight, so you can check out the photos and review here. Prior to take-off I am offered a glass of champagne by Daniela, one of the crew members for the flight; she’s so sweet and charming. She asks me the purpose of my trip and I mention it’s my birthday. She notes “oh so you’re a Leo”. I naturally assume she is also a Leo – only the best people are! But when I inquire; she states that she’s not a Leo, but her father is. The flight departs at around 3am in the morning, so after take-off, I decline to have dinner but state that I’ll sleep and then have the meal later in the flight. The chef takes my order for lunch and he’ll prepare lunch when I wake-up. 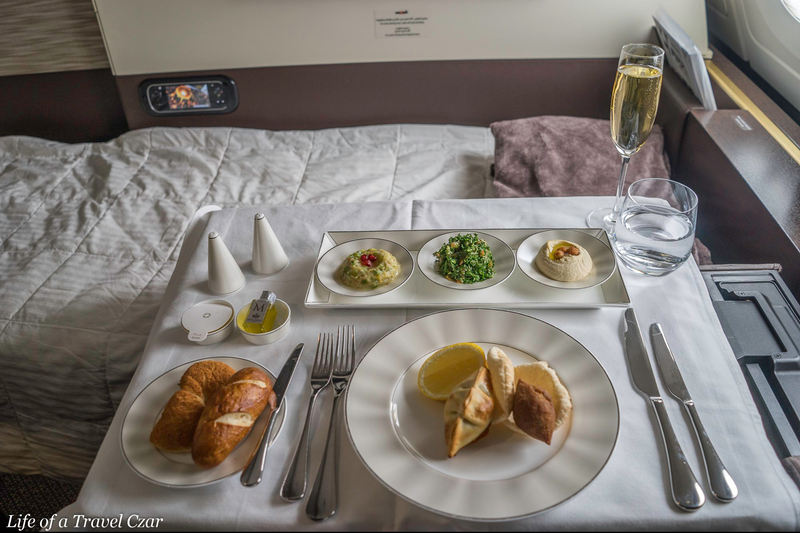 I love the dine on demand which some other airlines lack – it saves you from force feeding yourself at some unearthly hour. The bed gets made and I watch the Minions for a bit before nodding off to sleep. 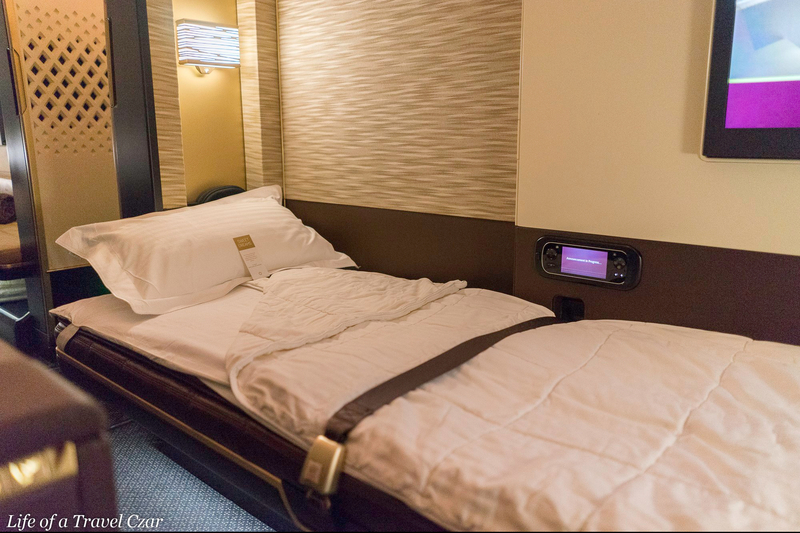 The fully lie-flat bed had a comfortable mattress, plush duvet, smooth cotton sheets, and pillows. 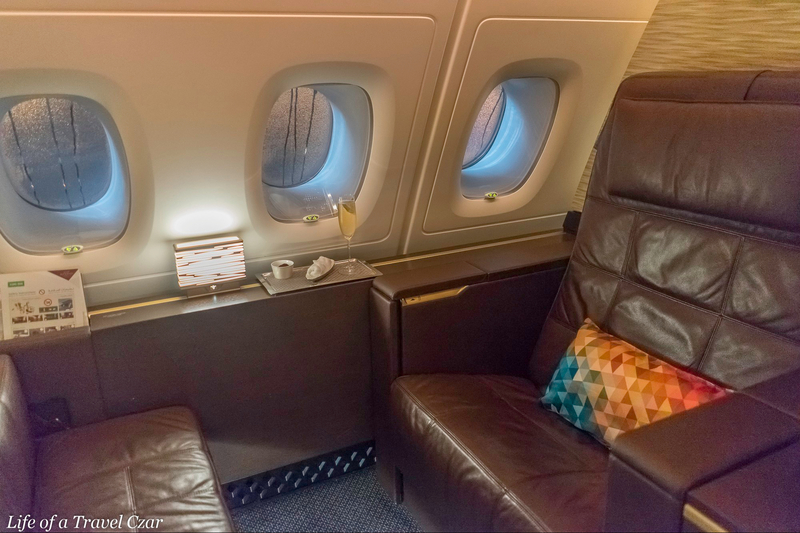 I loved the mosaic patterned pillow and the cabin temperature was spot on which is quite rare. I awake during the flight and open the window and see that we’re in sunlight. My sleep patterns are thrown with all the time zone changes. 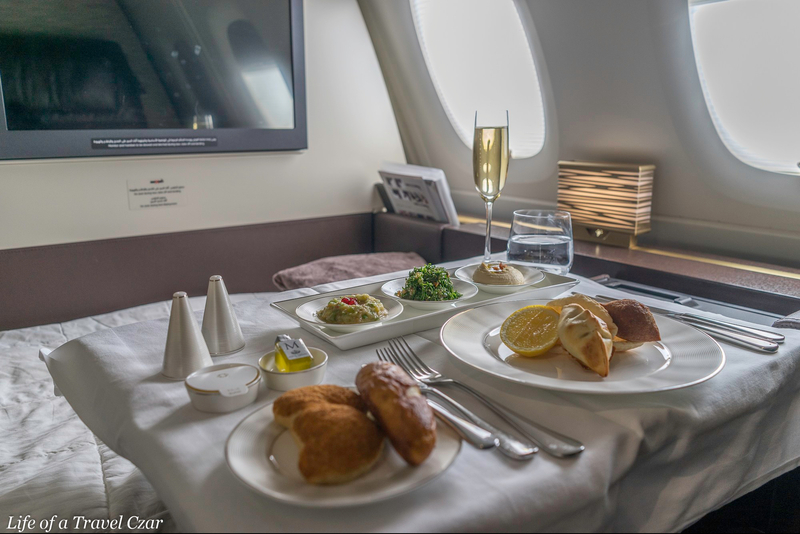 I love taking photos of the inflight food and beverage in daylight as they turn out much better than night time snaps even if the cabin lighting is bright. I ask to have lunch served and the chef obliges. I open the windows and the rest of the cabin is in the cover of darkness. 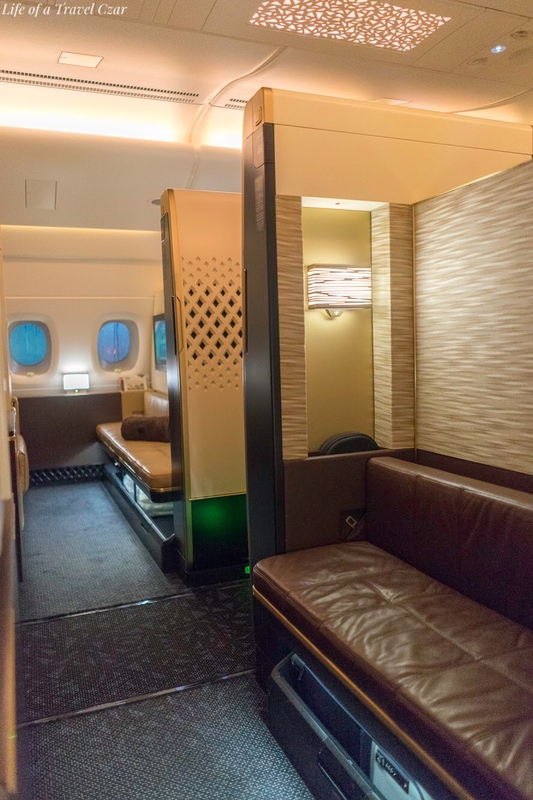 Although the apartments are fully enclosed, the doors are a little lower than I realised so the natural light flows into the cabin disturbing the other passengers, who promptly protest. Rosel, the cabin manager, approaches me to state that other passengers have complained. I was expecting them to shutter the windows; which would have been devastating, as I delayed dinner just so I could snap the food & wine in daylight. Rosel says she’s not going to ask me to shutter the windows completely, but just to do a semi-shutter. 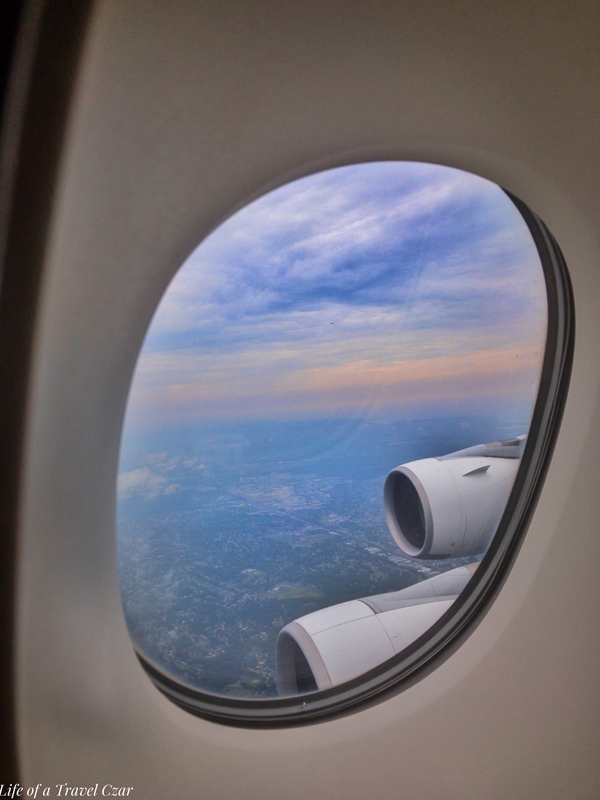 The A380 windows have three settings, closed, open and then a light shade (the semi shutter) which is in between the two modes. So, I do the semi-shutter and there’s still enough light to take some snaps to share with you. 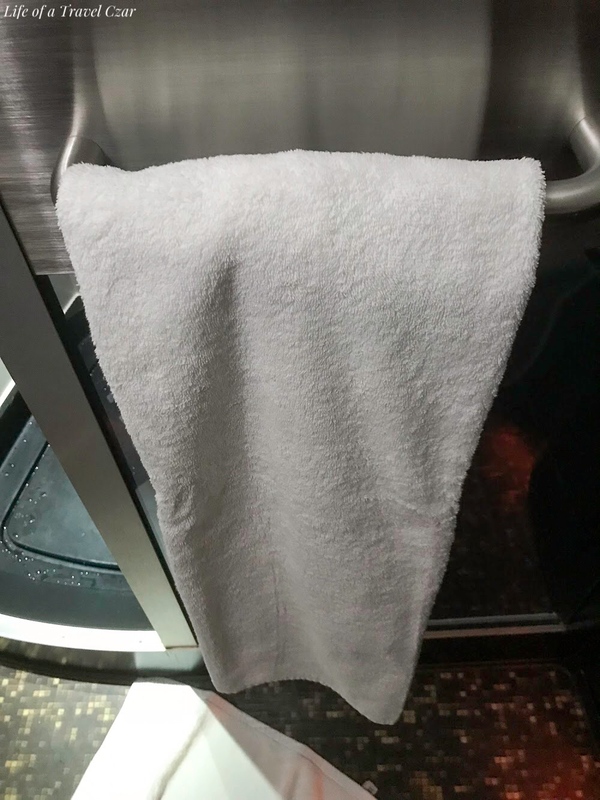 I was impressed with the way this was handled; on other flights I have been ordered to close the windows, but here a decent compromise is offered by the crew and the situation was handled so well. I start with the caviar. 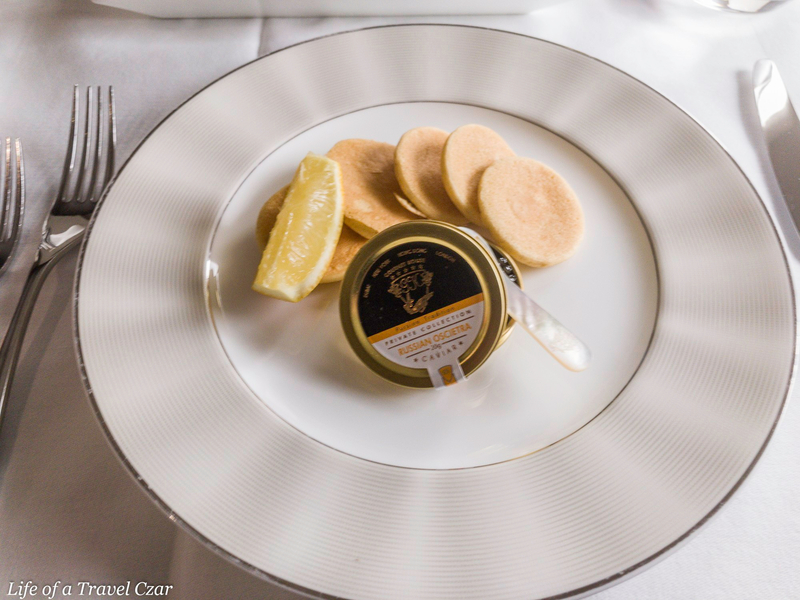 Like the earlier flight, Etihad serves Russian Oscietra caviar which is one of the world’s prized caviars and is harvested from the Ossetra sturgeon from the Caspian Sea. The caviar’s grey and golden reflective colour glows with an alluring invitation. I have had this on the flight before and it was a magical moment. Second time is also a charm; I place a little dollop on the mother of pearl spoon, and taste it and almost relive the initial moment – it’s quite a sensation. Each beautiful pearl contains a sensual medley of light salinity, a creamy flowiness, a nutty residue with a gentle sweetness which appears then disappears like a hidden treasure. The texture is precise and leaves a majestic feel on the tongue. The stone fruit flavours and acidity of the champagne lather on the palate to contrast quite nicely with the salinity of the caviar – there is a hint of latent salinity in this champagne which nicely melds to the sweet and salt together. The chef enters the apartment to check in on me and catches me savouring a moment of the caviar experience which proves mildly embarrassing. But there’s nothing to be ashamed about immersing oneself in this experience; it’s an assortment of taste, sensation, pleasure and luxury. I opt again for the Château Moulin-Haut-Laroque, Fronsac, Bordeaux, France, 2012. The Arabic mezze plate has some pita, tabouleh, hummus, another middle eastern dip, lamb kibbeh and a pastie. I tuck into the mezze and its rustic, I especially love tangy rustic hummus and the beautiful kibbeh. It’s a lovely interwoven taste of the gulf. If I close my eyes I could almost imagine sitting crossed legged in a traditional Emirati house enjoying such cuisine. When I placed the order before I slept, I did ask for the beef, dish but I was brought out the Steak Frites from the Lounge and Grill section the menu. Maybe I wasn’t clear (and I suspect that was the case), but I did think about sending it back and asking for the beef tenderloin from the a la carte menu, but I thought, why not try it and I can always ask for the other dish. I’m glad I did. The steak was cooked to perfection. It was tender and layered to perfection – the smoked caramelised outer portion, the medium ring just below it and the jelly like rare centre. The heat must have been just right for the steak to cook with evenly and precision. The juices flow effortlessly through the beef, its natural flavour shines thoroughly and it was seasoned just right! I have oddly had some amazing steaks in the sky than on the ground, and this one was a culinary master stroke. I sit there and gently work my way through the steak, each piece is savoured for as long as possible then washed down with the Château Moulin-Haut-Laroque. It is a gentle pleasure to work my way through this steak – I almost picture myself at a Friday lunch at 21 or the Four Seasons in idyllic fashion genteelly letting every minute linger for as long as it can. The frites are quite the treat; I don’t ever recall having these on a flight before; moist fluffy potato encased within the light crisp outer layer of the chip. It’s a little contrast of textures and pleasure found in simplicity. I skip dessert and continue sipping the Château Moulin-Haut-Laroque and watching movies and bit of the live TV. 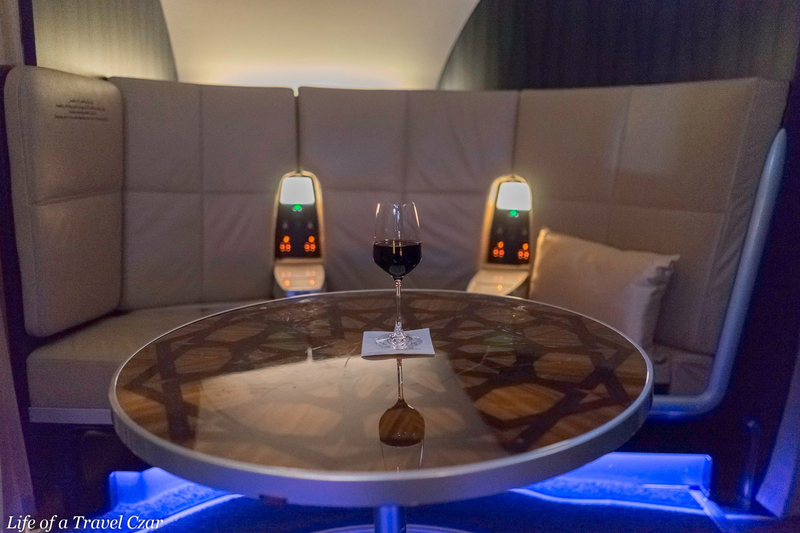 I wander down to the shared lounge area in between the First and Business Class cabins. There is no one at the circular lounge on this flight, so I have the area to myself. Daniela kindly pours me my choice red wine, although apparently, I don’t get the large wine glasses as they can only use the smaller glasses in the area. I relax at chill in the area, before realising that no one else is going to join me – all the passengers onboard seem to be asleep which is downright frustrating, so I head back to the apartment. I had requested a shower just before landing so I’m super fresh! Daniela prepares the shower and lets me it’s ready, but given the time to landing I only have 15 minutes which I’m fine with. I skip the induction given I’m familiar with the functionality. The shower suite is roomy and I love the rainforest style effect. I love the amenities from Omorovicza and feel suitably refreshed prior to landing. The water flow was amazing and I certainly didn’t feel like I had just been on two long-haul flights. 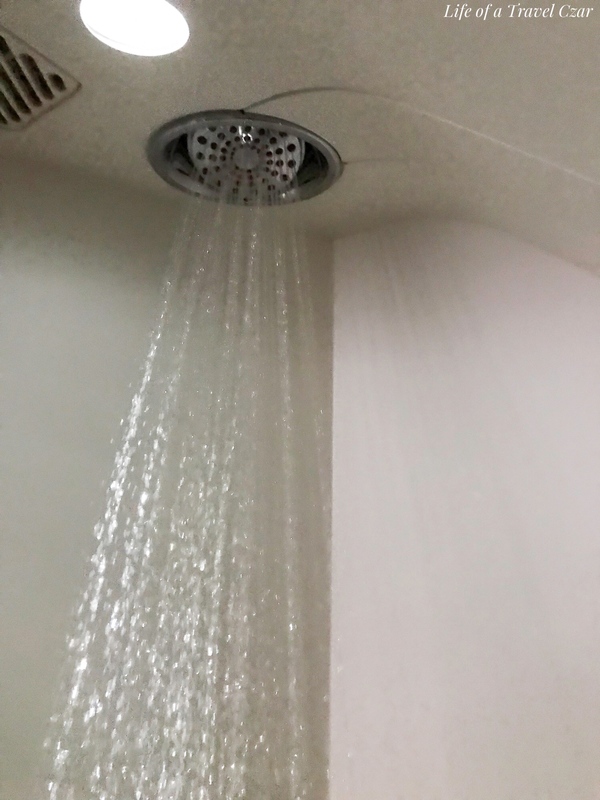 The first shower was quite an experience, but this one was more practical as I was landing in New York in the morning and check-in only opens at around 2pm at the hotel. 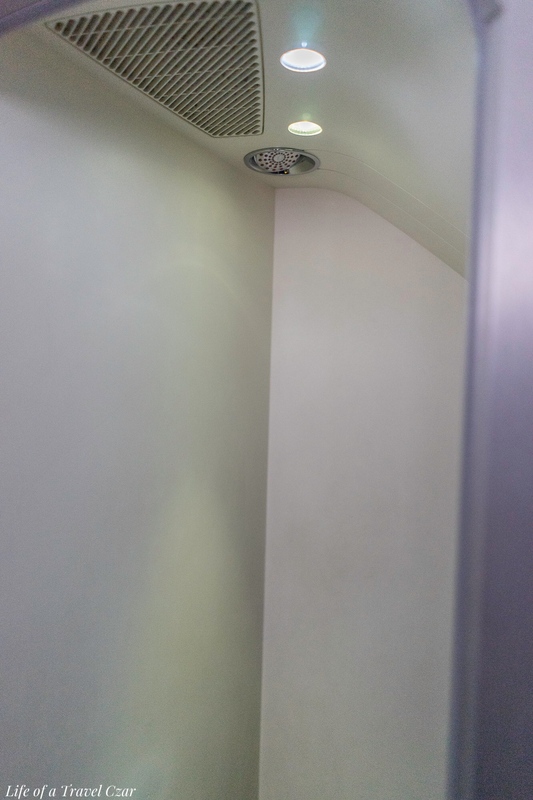 It was difficult to give you a full view of the shower in pictures, so please check out the video diary below for a full overview of the shower suite. I opt for silky scrambled eggs, potatoes and veal rashers. This time, the chef provides the wine for the pairing. It is a moment of luxe but with the signature simplicity of the moment to tuck into beautiful buttery silky scrambled eggs onboard with a nice touch of salinity and crisp of the rashers. The fluffy potatoes are a treat and the rich thick creamy hollandaise holds the dish together. I sip the coffee and the wine interchangeably as we head across towards the US east coast. It’s quite a treat when the eggs are as fluffy as the clouds you’re gazing at through the window. The flight eventually commences its descent into New York (JFK). Grey skies greet our arrival but the cameras on board provide a good view as we land. I head off the plane and pick up my luggage and make my way into beautiful New York City. 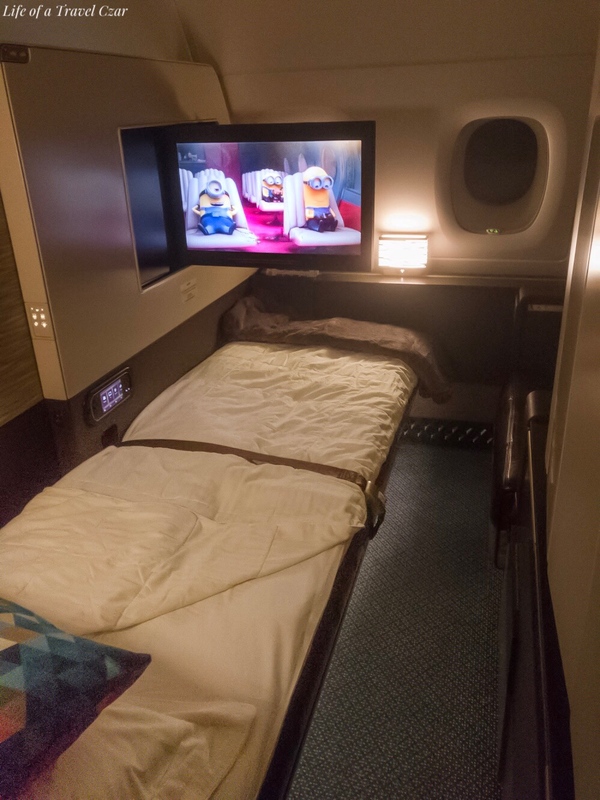 It’s a little hard to show the full extent of the Apartment, the Bed and the Shower in pictures due to how large they are, so I’ve compiled a little video diary of some of the highlights of the flight. Hope you enjoy it. 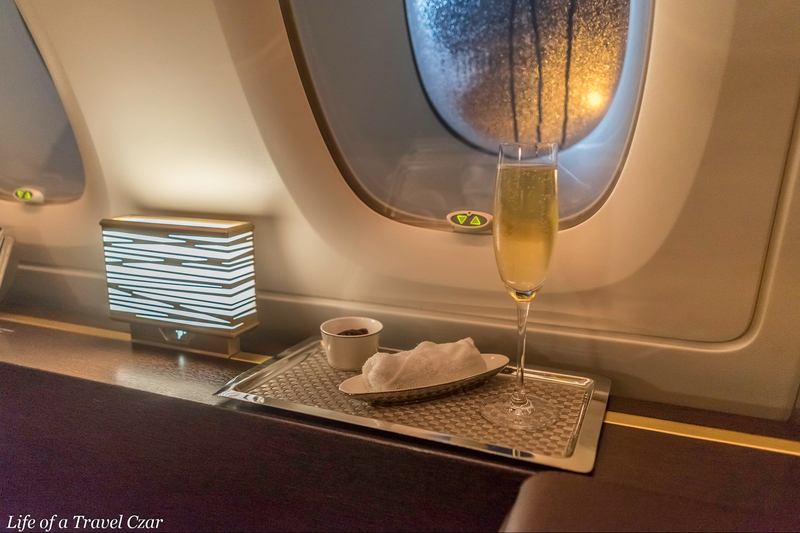 This flight was one of the best flights I’ve been on: I would confirm the aspects of the hard product from my previous summation; the apartment is probably the most amazing product out there (albeit now rivalled by Singapore’s new First Suite which I haven’t tried). 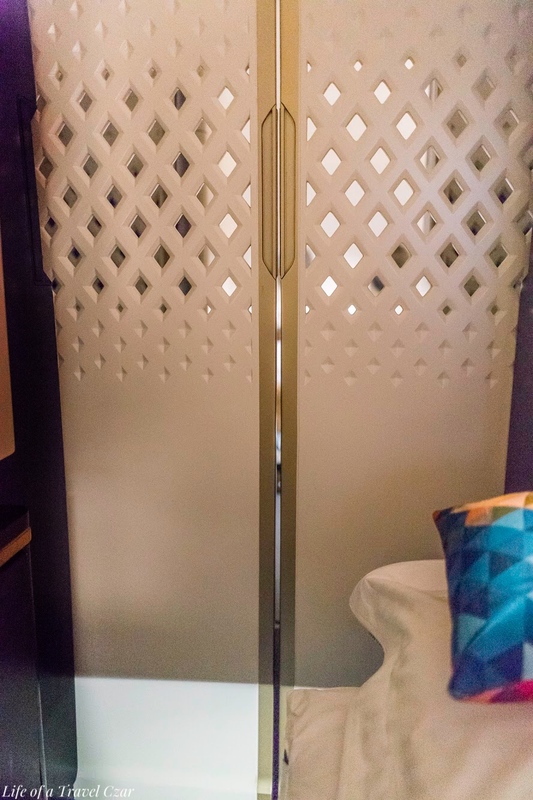 It is spacious, offers unparalleled levels of privacy, a spacious bed / ottoman, very wide lounge chair. There are wonderful touches such as extensive lighting options, in-seat massages, private mini-bar and vanity cupboard. I have heard reports previously of the bed being too hard, but I didn’t find this to be the case, the duvet and the bedding was quite comfortable and I did enjoy a lovely night’s sleep. 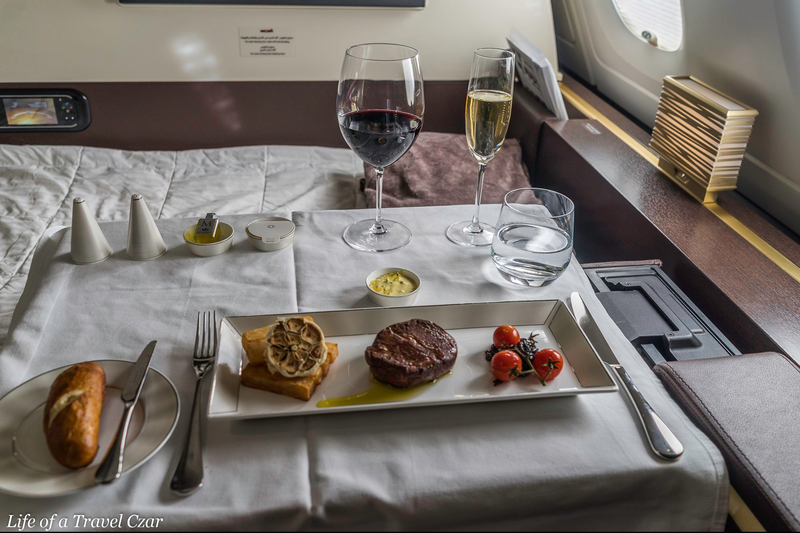 The reason this flight stood out was because of the service and the chef; The three crew members who looked after me were on the ball throughout the flight. They were friendly, personable, charming and engaging at a level that was above my experience on other carriers which are normally renowned for personable service. Daniela, Rosel and the chef (whose name escapes me) were just incredibly impressive. This is especially pertinent given it was an overnight flight where normally the service levels would be trimmed compared to a daytime flight. Not on this flight – it was a full court press! 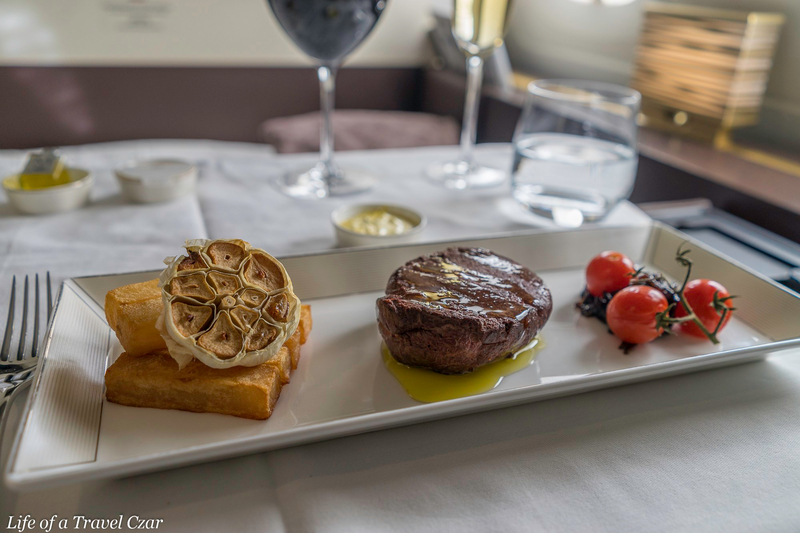 The standard of food on this flight was a step up; the caviar would receive the same marks as the prior flight, the steak and frites was just perfect and will be my go to dish in the future – I did my best to savour every moment of it. I admit I’m not a connoisseur of Arabic mezze was well set out and was better than what I had on Qatar a few years back. The scrambled eggs were a winner…. well executed scrambled eggs never go astray in my books. The chef tailored each dish and some of the dishes had special touches which weren’t on the menu. 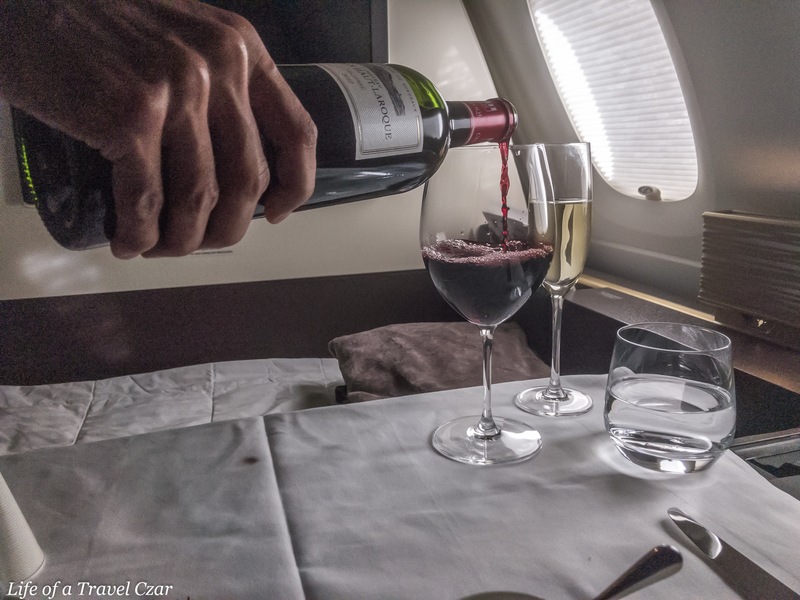 The wine list still probably lacked the punch of JAL’s cellar, but the champagne was decent and the Château Moulin-Haut-Laroque did grow on me on this flight. Now the shower proved to be pretty important on this flight and was a winner. I landed in New York in the morning and as it turned out the hotel took forever to get my room ready beyond my expected check-in time. Feeling super refreshed I could take a stroll through midtown Manhattan without having to hang around waiting for my hotel check-in to freshen up. 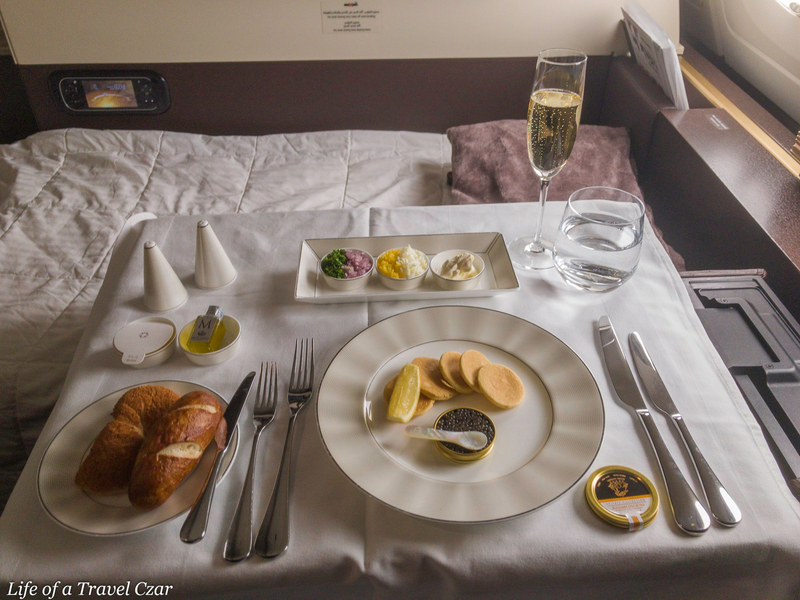 Definitely my favourite First Class experience!